Do you remember eating ‘dirt’ when you were a kid? 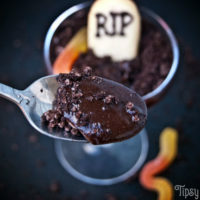 Chocolate pudding with crushed up Oreo cookies and a few gummy worms thrown in for good measure? 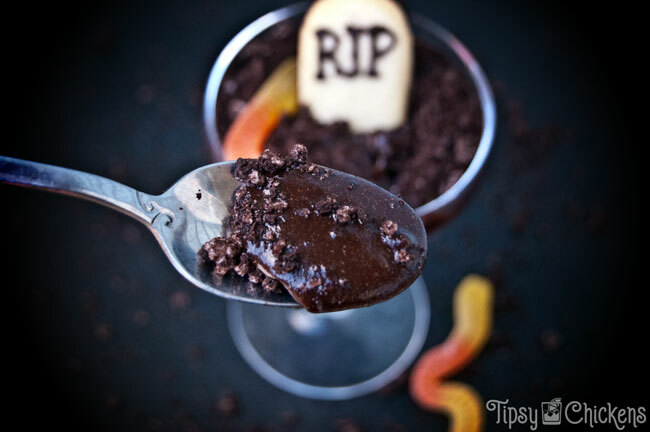 It was an easy dessert and you could turn it into a Halloween treat with the addition of a cookie tombstone or a candy pumpkin. Today we’re taking that delightful childhood treat and making it for the adults. Halloween has always been my favorite holiday and the only time I enjoy party planning. 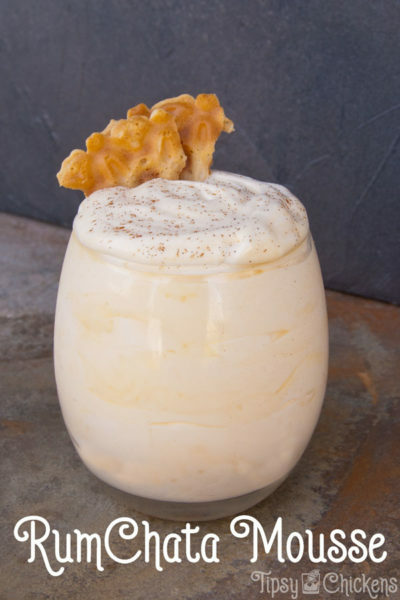 This is the perfect boozy dessert for a small gathering or a group. Serve it in stemmed cocktail glasses for a fancy look or a giant trifle bowl on the buffet table. Most of the work can be done ahead of time, it only takes seconds to throw everything together for serving. Just make sure you keep this one off the kids table! I used a bulk dark chocolate pudding mix from the local Mennonite market, I have seen dark chocolate pudding available in regular stores though. If you can’t find the dark stuff regular instant chocolate pudding will work. The color was dark but not quite black enough for my Halloween enamored soul so I dumped in a tablespoon of almost black dark cocoa powder. This is another optional step, I did it more to change the color than the flavor. The instructions on the pudding I used claimed it would be set after an hour. I did not find that to be the case, however I also ignored all the other instructions so it’s my fault not the puddings. I did find that it sets up more over night. If you can’t wait that long you can eat it, it will still be delicious but it’s going to be runnier than pudding should be. Why isn’t the pudding setting? Because we’re throwing out the instructions and using Creme de Cacao and heavy cream. Creme de Cacao comes in white or clear and a dark variety. I went with the dark stuff. What’s a classic Halloween graveyard without some delicious grave dirt? Of course I turned to Oreos. If you’re cranking out giant batches feed free to bust out the food processor but I think you get more realistic dirt chunks if you beat them up with a rolling pin or rubber mallet. If you want to add some letters to your tombstones, be it RIP or the initials of your party guests, grab some candy melts and a piping bag. You’ll need a small handful of melts, I used the leftovers from my Kahlua cake pops so I can’t give you a specific measurement. To ballpark it, you’ll need less than a wafer per cookie, but be careful melting that small of an amount. It’s going to go from solid to melted to overcooked in an instant. Melt the wafers in the piping bag and knead it to make sure it’s not lumpy. Snip off the very tip of the piping bag. Start with the middle letter to keep everything centered. Have a few extra cookies on hand for mess ups. You can layer these up early but you’ll get soggy cookies. If you hope to avoid that put them together right before serving. Dump a spoonful of crushed Oreo’s into the serving glass, spoon in some pudding. 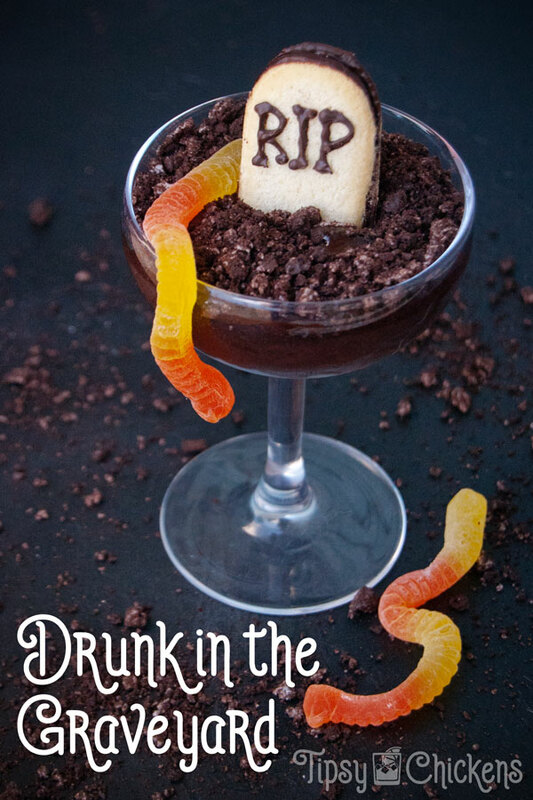 Top with more cookies, add a tombstone and a gummy worm. 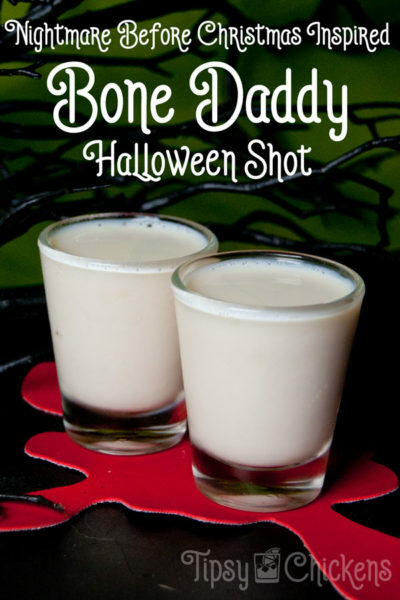 You could also add one of those odd pumpkin candies that are distantly related to candy corn.